What made this extra molten was adding some solid chocolate bits in the middle of the cakes batter. No one would ever know they’re in there (at least not yet)! The teacup cakes baked up nicely, and as they cooled, the centers sank down because the there was only chocolate goop holding up the thin cakey crusts. I lined my ramekins with a layer of sugar and it created a tiny bit of crunch to the sides of the soft and gooey-centered cakes. These cakes baked for 10 minutes, which Dorie wrote was enough to get a thin crust and a molten center; 12 minutes would have made a cakier cake. The centers were perfectly molten, but not too soupy, and not too thick. I used bittersweet Ghirardelli chocolate and it really made these Soft-Centered Chocolate Teacup Cakes delicious! 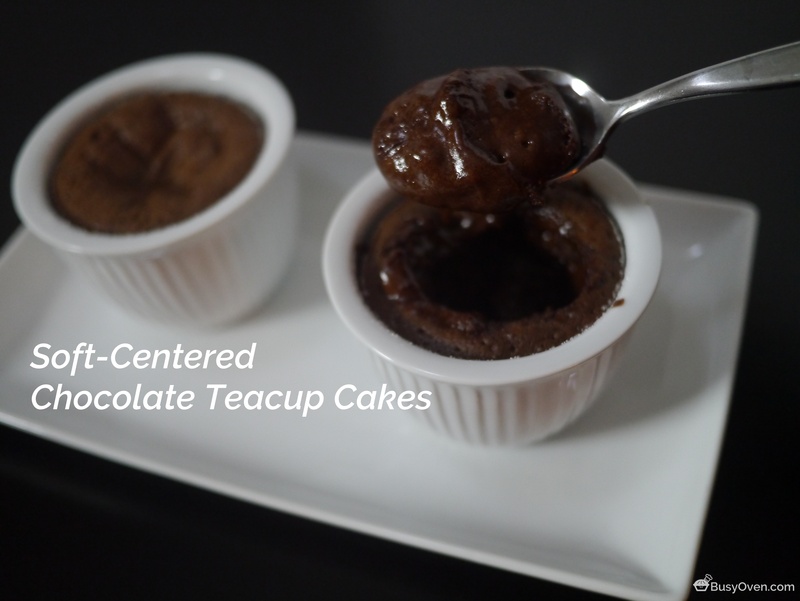 My tasters and I enjoyed these Soft-Centered Chocolate Teacup Cakes. I’d imagine some vanilla ice cream would go really well with this warm cake. I didn’t have any in my freezer when I made these cakes, but they’re so easy, I’ll just make more the next time I have ice cream in stock! Soft-Centered Chocolate Teacup Cakes recipe is on page 191 of Baking Chez Moi by Dorie Greenspan. These were heavenly and we really enjoyed them. Looks like yours came out perfect. mmm….chocolate goop! these look fantastic! These look so good. Your photos make you want to dig right in. We had ice cream with ours and it was the perfect touch! Your cakes look like they came out perfectly.